This is a double page spread from Ben and Le-Anne’s wedding album and shows the period of time quite late in the wedding day, well into the reception. 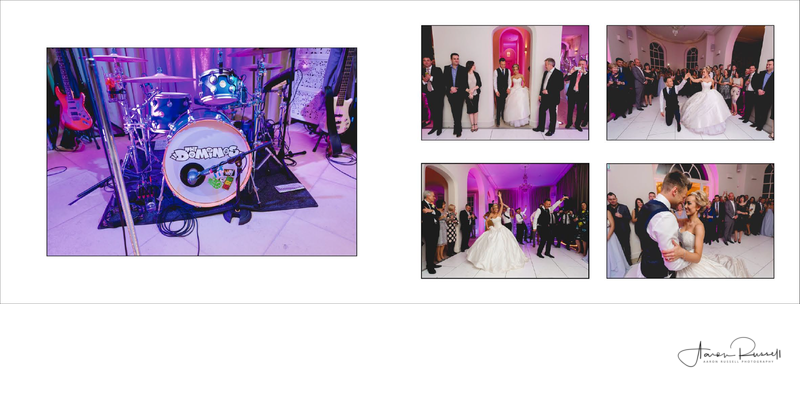 On the left page we can see the band’s drum set, with the base drum really being shown off here – the reason I took this photo was that I found it to be the most interesting way that I could get an image that would remind the bride and groom of the band that they had chosen for their wedding. On the right page is a selection of 4 images showing the couple first taking to the dancefloor in the upper left-most image. The remaining three images on the right page shows various dance-moves that were pulled off by the couple in front of their guests! In order that all of my wedding photos are at the highest possible standard, I usually light the first dance myself, not using constant lights, instead using flashes that provide exactly the type of light that I am looking for. A lot of photographers these days will label themselves as ‘natural light wedding photographers’ which is all good and well on the face of it, but then again, how much natural light is there at night? Or on a dancefloor? Do these photographers go home when the sun goes down? I do often wonder. To get around this, as I mentioned, I like to light things for myself when there is no natural light to rely on. As I am complete control of the lighting, I know exactly how the image will look and therefore all of the images I deliver are to the same standard. Modern day digital cameras, especially SLR cameras (Single-lens reflex) are very good in low light, so you might ask why this extra light is needed at all. The more sensitive you make a camera to light, the more the image quality ultimately suffers. Yes, you can shoot in near-dark conditions with a modern day camera but you pay a price with the image quality and clarity. Using off-camera lighting means that you still get the same image quality as you do from the rest of the wedding day. Using extra light means I can keep my camera settings at reasonable levels.